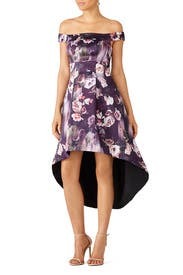 A bold silhouette collides with a feminine floral print in this high-low gown by Slate & Willow. We love to style it with a black clutch and the Astral Drop Earrings by Sarah Magid to complete the look. 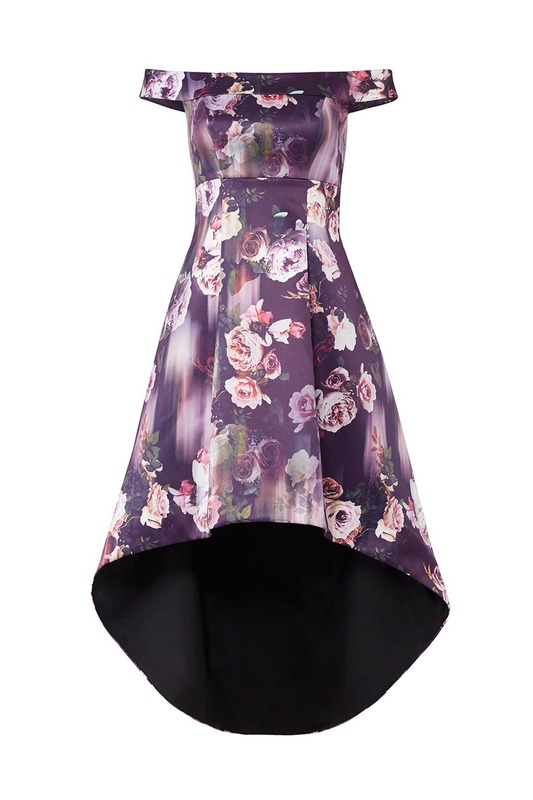 Purple printed crepe (100% Polyester). Full skirt. Sleeveless. Off the shoulder neckline. Hidden back zipper with hook-and-eye closure. Fully lined. 29” from bust to shortest hemline, 43“ from bust to long hemline. Imported. 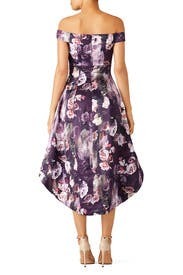 The length of a long gown in the back but still easy to walk in, loved this purple floral dress. Medium weight material was lined throughout and has a nice sheen. Bodice was fitted with no give but dress flared at the natural waist, which flattered my pear shape. I didn't bother with a bra since the bodice was snug. This was a huge hit for a fall wedding outdoors. My only issue was the arm straps are a little prohibitive of dancing too wildly on the dance floor! Great dress. Tons of compliments. I wish I could keep it. So many compliments and has pockets!!! My favorite dress from RTR so far! This dress fit like a glove (true to size). The fabric is a little thick (not hot) so it holds it's shape well and flatters your natural figure. It is easy to move in and the color pops (pictures don't do it justice). I got so many compliments on it and highly considered purchasing it! You will not be disappointed with this dress. 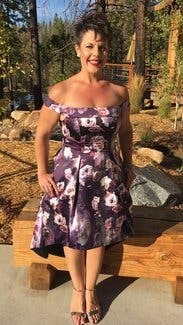 I loved this dress for a fall wedding in California - a nice balance between fall formal and warm weather outdoor dress. Slate and Willow tends to run a little big on me. I normally wear a 4 but the 2 felt a tad loose. The arms were more restricting than I expected. Overall loved the look. 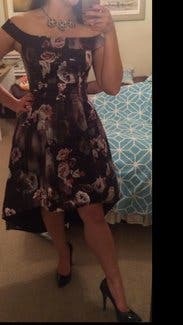 I loved the dark floral print and the high/low length of this dress. the quality is very good, and it truly stood out in a good way at the fall wedding I attended. The off-the-shoulder neckline is lovely, but it did restrict my dance moves which is the only reason this gets 4 starts instead of 5. I wore my typical size 4 which fit well with the exception of being a little snug in the upper waist / rib cage area. In hindsight, the 6 probably would have been more comfortable for the duration of the evening, so I'd suggest sizing up for your back-up. I loved this dress. It fit like a glove. This dress would be flattering on any body type. It's fitted on top and loose everywhere else. It is true to size. The color and print are beautiful and perfect for an outdoor wedding. The pockets are also a huge plus. Although mine dress came with a long piece of red tape under the left side pocket. 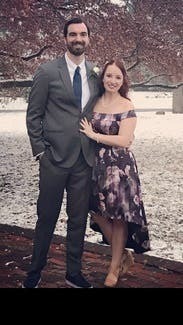 When I took a closer look I noticed the dress was torn about 6" at the seam. This was disappointing. Not sure why RTR would rent out a dress in this condition. So for that reason only I'm giving it 3 stars. I wear a size 12 and 36C. I am 5'9" 160lbs. I rented a size 12. Flattering, comfortable and more. A truly wonderful dress. Love love loved this dress! Absolutely beautiful and comfortable! Felt so gorgeous! The fit was perfect. Hugged in all the right places. Even though the sleeves were a little restricting it didnt impact my evening. I chose to wear a strapless bra but its so fittinf tou could probably go without. 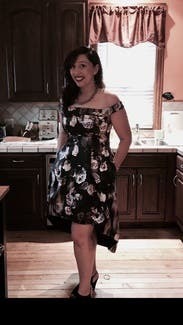 I've never felt so good in a dress. I received so many compliments! I'd definitely order this one again. Very Flattering! Compliments all night! I wore this for a themed Holiday party for work. 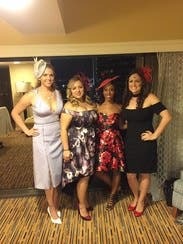 The theme was basically Kentucky Derby style, and this fit the theme perfectly! 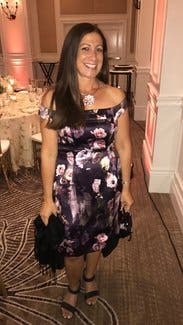 It was a very flattering dress, fits true to size. I am actually a size 10, but since I had a 36DD chest, I had to size up to the 12. 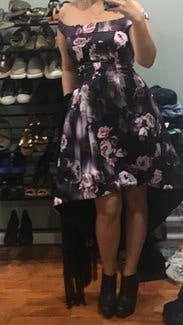 I am 5'2", 190 and this dress fit like a glove. I was getting compliments from everyone all night! The only problem I had with this dress was that you can't really raise your arms. Not for pictures or for dancing. One of the arms already had a small tear near the armpit area, and throughout the night, the tear just kept getting worse and worse. By the end of the night, I could no longer wear the dress, the rip had gotten so bad. The dress also came with a small rip at the back of the dress, but I noticed that the Size 10 dress had the exact same rip! Must be common with this dress. Bonus: dress has pockets! I didn't realize this fact until almost the end of the night, so take advantage of those!! 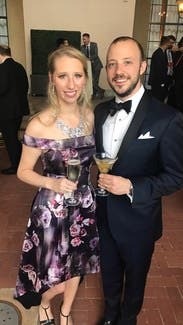 I would wear this dress again, but just pay more attention to arm movements. 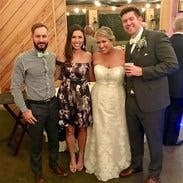 The Slate and Willow dress was perfect!! Thank goodness the size 4 fit, because the 6 was coming apart at the seam and was totally unwearable. If it hadn't been for that this would be a 5-star review. We rented this for my daughter. 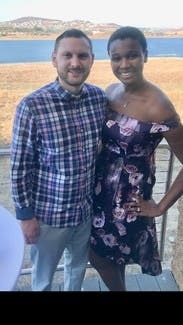 Spring wedding - it’s hot in Arizona so I needed something cool. I I know other reviews said arms are tight but you seriously don’t know how much that affects your entire manorisims. I talk with my hands so I felt “strapped in” significantly. Fit well, tappers at actual waist so o could eat and still breath. 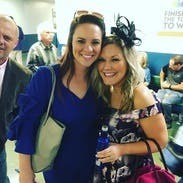 This dress was perfect for the event, the Arkansas Derby. I selected that it fits small because it was right around my rib cage. 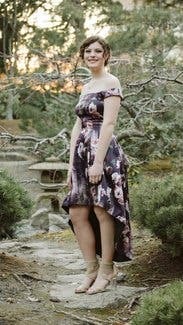 Loved this dress, and I received tons of compliments. The bride said I was upstaging her! It was a little loose on top, so that's what made me wear the size 10. The 12 fit better around the middle, but was too loose on top. Loved the pockets! I liked the print a lot, but found the arm strap design unusable. I felt like someone tied a rope around my chest. Lost all range of motion in my shoulders. I ended up not wearing this dress because of it. 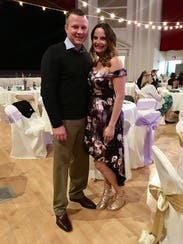 This was my backup dress. 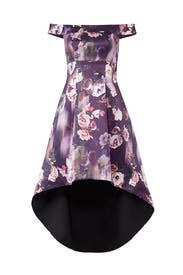 Looked beautiful on but runs small, it was too tight around the waist/torso. Would recommend ordering a size up. This is definitely one of the RTRs where everyone was asking about my outfit! It was super easy to wear, strapless bra worked well, and the cut is flattering on a variety of body types. Fitted at the waist without much give but was very comfortable.